The Mass for the feast of the Assumption at English Martyrs Church in York will now be a Missa Cantata. Fr de Malleray of the Priestly Society of St Peter will be the celebrant, and the Mass will be at 7.30pm. Fr Maughan will also be saying a traditional Mass for the feast of the Assumption. His Mass will be at 7pm at his church in Loftus. 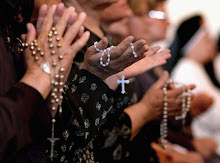 The Latin Mass Society is organising a pilgrimage to Lourdes from Monday 17th to Friday 21st September 2012. Departure is by air from Stanstead Airport on the Monday morning and the return flight arrives at Stanstead on the Friday afternoon. Prices are in the range £500 to £600 according to choice of hotel etc. 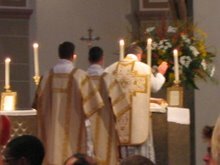 A traditional Mass will be celebrated each day, and there will be opportunities to do all the usual things. The easiest way to book is to go to the Latin Mass Society website, www.lms.org.uk and look under pilgrimages. An application form can be downloaded from there. The feast of the Assumption is Wednesday 15th August, and not Monday. The Mass will be at 7.30pm on Wednesday 15th August. Sorry for the confusion. There will be Mass at 4pm on Sunday 22nd July at the Church of the English Martyrs in York. There will be a Low Mass in the Church of the English Martyrs in York at 7.30pm on Monday 15th August, the Feast of the Assumption. The celebrant will be Fr Armande de Malleray FSSP, who will be visiting York at the time. It may be that the Mass will be a little late starting because it will follow a parish Mass at 7pm. We're getting quite excited in the Rudgate Singers about our next service, the Founder's Day requiem at Barnard Castle, just across the Tees in the Diocese of Hexham & Newcastle. Not only does it promise to be a good sing with some singers joining us for the first time, but we believe that it will be the first ever performance in its correct liturgical setting of the Requiem Mass by Robert Lucas Pearsall, probably better known in choral circles for his adaptation of In Dulci Jubilo and Lay A Garland. So, if you want to hear a world first, come along to St. Mary's Catholic Church in Barney (literally next door to the Bowes Museum) on 21st July at 12noon! Meanwhile, in York, Compline by Candlelight continues on each Saturday in July at St. Mary's Bishophill Jnr commencing at 9pm.